Massage is a positive and relaxing way of easing muscular aches and pains, assisting in the prevention of soft tissue injury and aiding in the healing of the body, mind and spirit. With beautiful rooms inspired by South East Asia, The Sanctuary at Hove is the ideal retreat from the stresses of everyday life, work and sports training. Our qualified Remedial Therapists can offer a range of massage treatments to suit your individual needs, or those of your loved ones. 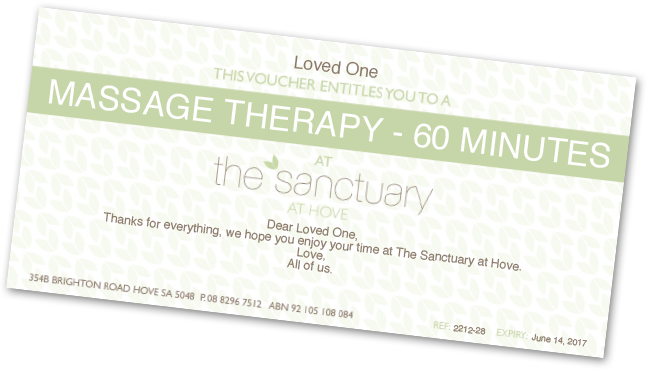 How about the gift of massage at The Sanctuary? Customise, preview, purchase & send vouchers instantly! We offer a wide range of services at The Sanctuary. Heated smooth flat stones are placed on the body at specific points, the heat warms and relaxes the muscles allowing a lighter massage or deeper pressure to be applied if desired. Remedial massage is a holistic treatment using a wide range of specialised massage and diagnostic techniques to heal a specific problem. Specifically for sporting injuries or ailments, this is a vigorous and deeper massage to a relaxation massage. We offer Myofascial Therapies including Cupping and Release. Our Myofascial Cupping is highly sought after. For some great results book in a session. One of my most favourite days every month is ‘massage day’. I so look forward to my hour cocooned in the peace and tranquility that is The Sanctuary at Hove. I regard my therapist Tulani as my healer and I know that after my massage I feel inner peace. The Sanctuary At Hove is my refuge from my busy life. When I go there I feel as though my cares melt away whilst I enjoy being pampered and relaxed in very calm surroundings. Always a pleasant and relaxing experience – the staff take the time to listen and tailor your massage needs. Having massages at The Sanctuary has helped me recover from an injury and been fabulous in helping me to de-stress. We visit The Sanctuary approximately every month. We find Tulani has the right touch, the right amount of pressure to soothe aching muscles and easy away aches and pains.